Your eye has a clear lens through which light passes, allowing you to see. When the lens loses its transparency, the cloudy tissue that develops is known as a cataract. Cataracts affect millions of people each year, including more than half of all Americans over the age of 60. 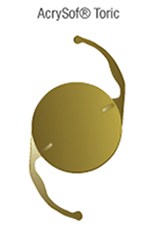 Cloudiness develops as a result of a buildup of protein in the lens. Over the course of time, cataracts cause a progressive, painless loss of vision. Cataracts can occur in either one eye or both eyes. If the cataracts begin to interfere with your ability to read, work or do the things you enjoy, you may want to consider cataract surgery to restore your vision. If cataracts are in both eyes, your surgery will be performed on one eye at a time, usually four to eight weeks apart. Cataract surgery is the most commonly performed surgical procedure in the United States. Approximately 90 percent of the people who have had cataract surgery have improved vision after the procedure. Cataract surgery replaces the cloudy natural lens of the eye with a clear artificial lens, known as an intraocular lens (IOL). Our doctors perform a minimally invasive, small-incision, no-stitch cataract surgery called phacoemulsification, also known as “phaco”, surgery. During this procedure, a tiny incision is made in the eye making room for a small ultrasonic probe. This probe breaks up, or emulsifies, the cloudy lens into tiny pieces. The lens pieces are then suctioned out through the probe. Because of its small size, the incision will be able to heal on its own with only a topical eye drop, so there are no injections or stitching in the eye at all. 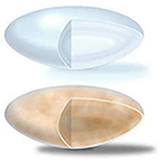 After the cloudy lens has been removed, the artificial IOL is implanted in the eye. The advanced foldable IOLs is inserted through the same small incision that was made to remove the original lens. This process significantly reduces recovery time while improving safety and reducing the risk of bleeding, scarring, irritation and distortion. Click here to view an animation of the cataract removal procedure. 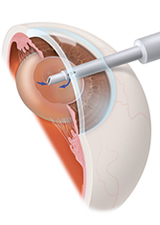 The latest innovation in performing refractive cataract surgery is the LenSx Laser from Alcon. It is the first femtosecond laser to receive FDA clearance for use in cataract surgery. 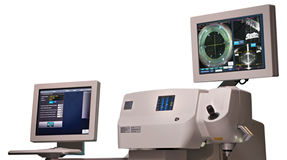 The LenSx Laser offers three-dimensional, high resolution images that map each patient’s unique eyes. These images, combined with the computer-captured measurements and information about your individual eyes, allow the doctor to achieve greater precision and customization than ever before. The LenSx Laser is optimized with true image guidance, helping the surgeon determine the best location and dimensions for incisions. The bladeless femtosecond laser provides pulses that actually create targets within the eye and then delivers incredible accuracy. The LenSx Laser is an effective technological advancement that ensures the highest level of precision throughout every step of your procedure, resulting in successful outcomes time after time.